In this episode, we continue our intensive practice with irregular verbs. We have grouped the verbs so it will be easier to memorize and thus learn them properly. First, there is a listen and repeat section followed by practice putting short sentences into the simple past tense. This podcast is intended for hard-working learners who want to perfect their English. 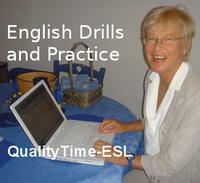 Teachers interested in more effective teaching can order “QualityTime-ESL: The Digital Resource Book 2.0” at our store.